The development and distribution of effective literature and handouts are vital. Messages that voters can hold onto, absorb at their convenience, or refer back to keep your campaign working, even when group meetings or one-on-one contact are over. LRI has a variety of coordinated messages available in a choice of formats. Campaign Posters: Full-size, full-color posters to be displayed in employee areas. Plus a large “Union No” graphic. Each poster is printed on high quality paper and ready to be displayed in employee areas. The questions most commonly asked during a union organizing campaign are answered in this series of bulletin board posters. Order the topics that are most meaningful to your campaign. Each poster is printed on high-quality paper and ready to be displayed in employee areas. Campaign Flyers: Professionally designed flyers focus on core issues common to most campaigns. Professionally designed union-free flyers help you to further focus on issues common to most organizing campaigns. For maximum impact, we recommend coordinating flyer distribution with the presentation of LRI employee information videos. Each flyer is ready to be reproduced and given to voters. Available in English or Spanish. Choose a full set or select individual posters. They will be updated with the latest information gathered from our databases. It’s a great way to show, with some humor, the facts about the union that the union would rather remain left untold. Custom Campaign Use a few words and eye-catching images to get across union-specific facts. Custom posters can say a lot with only a few words and eye-catching pictures. These posters let employees know a multitude of facts about any union you choose. Each poster is filled with specific information about the union seeking to represent your employees, including election results, strike history, unfair labor practice charges, plant closings and more. Custom Posters may require up to three days for research. 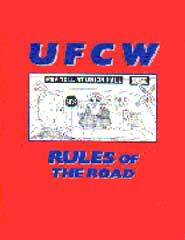 Rules of the Road: Union-specific, multiple-page flyer highlights the restrictive rules contained in the international union’s constitution. Cartoons: A humorous way to deliver important messages-ideal for making handouts. Unions are not typically a source of humor. There’s nothing funny about living through a strike or crossing a picket line, not to mention the day-to-day hassle of working or managing under a union contract. But when we began our subscribed monthly publication Labor Relations Ink more than 14 years ago, we couldn’t resist the chance to poke fun at a target as big and ripe as organized labor, thus “Union Toons” began. This union-themed cartoon strip usually features Fat Cat, a tubby tabby that’s part union boss, part pirate, and entirely out for himself. 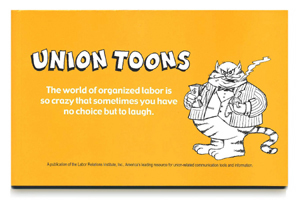 This book is a compilation of what we think is the best of “Union Toons,” plus each LRI Christmas card presented chronologically and reproduced in its original color version. It’s said that comedy is serious business. If that’s true, the inspiration for these “Union Toons” is hilarious.